One of the pioneers of modern microbiology, Antonie van Leeuwenhoek, referred to microscopic organisms including bacteria as “tiny animals.” Like animals, bacteria exhibit a diverse range of behaviors that allow them to interact with their environments and flourish under different environmental conditions. One way bacteria interact with their surroundings is through extracellular appendages such as type IV pili that are present on the cell surface and can promote virulence, attachment, motility, and more relevant to this story, DNA uptake during natural transformation. Naturally transformable species are able to internalize environmental DNA and, in some cases, incorporate it into their genomes, a process that leads to the spread of antibiotic resistance genes and virulence factors (I probably don’t need to belabor the importance of learning about the mechanisms contributing to antibiotic resistance given the many recent reports in the media about antibiotic resistant tuberculosis and gonorrhea becoming more widespread). While we knew that pili were required for DNA uptake during natural transformation by many species including our model bug, Vibrio cholerae, the mechanism by which these tiny fibers mediate DNA internalization has remained elusive due to difficulties in visualizing them in live cells in real-time. We recently developed a tool for labeling diverse pilus systems where an amino acid in the major pilin subunit is replaced with a cysteine for subsequent labeling with maleimide dyes allowing for direct observation of functional, fluorescent pili. By simultaneously fluorescently labeling DNA and pili, we were able to add cells with labeled pili and DNA together and watch the magic happen. This tool allowed us to directly observe bacteria using their pili to take up DNA by binding to it via their tips and pulling it inside the cell through retraction. 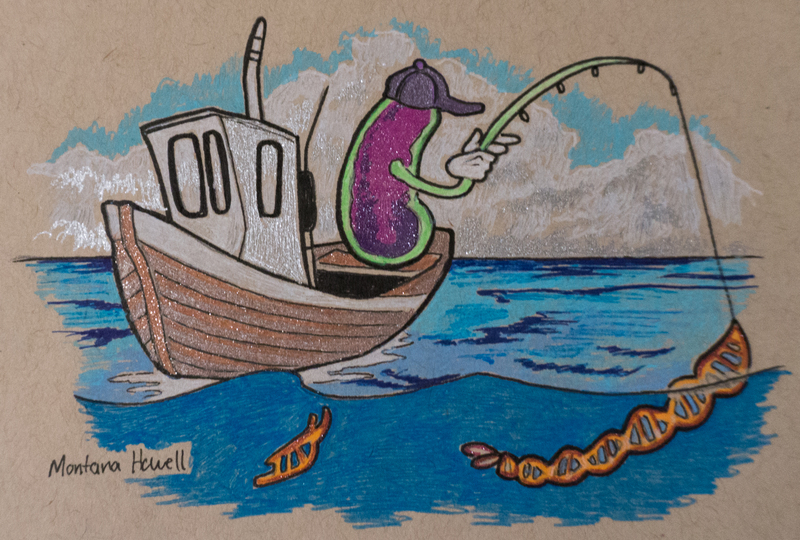 Importantly, mutants incapable of binding DNA with their pili were deficient in taking up DNA, demonstrating the importance of the “hook” in this process where bacteria fish for environmental DNA. An additional and intriguing finding of this study is that mutants lacking pilus retraction machinery (aka the way bacteria reel in their line) were still capable of taking up DNA, albeit to a much lesser extent. Upon further investigation, we found that these “retraction mutants” were actually still capable of reeling in their pili, and that this slower, less forceful retraction allowed for a low level of DNA uptake to occur. This study opens the door to many new and exciting questions. What are the mechanisms of pilus retraction in the absence of the canonical retraction machinery? How do cells evolve to bind DNA, and what factors are most important for DNA internalization? How do the forces that drive bacterial nanomachines play into their function? Perhaps, as we begin to answer these questions and learn more about these tiny structures and how they accomplish DNA uptake during natural transformation, we can move towards the development of tools to prevent the spread of antibiotic resistance in the future.